To the good men/women of the DOD. Consider applying for your MD CCW under the grounds of being a DOD employer/contractor. This is NOT MINE.. but it's proof they do exist for reasons other than "business owners" like some people will have you believe. Who is "some people"? Any search here would show DOD. and others like Emt' s. Etc. Get permits. You have to apply to know for sure. Right now, MSP is looking at the 438..... number as to who's card this is..
agreed. Apply.. vote.. and be good to each other! Current status of DOD permits is that you need TS/SCI clearance with daily access in order to get one from MSP directly. Otherwise you have to fight it. ODNI SEAD 3 is the ace in the hole for any one with a clearance. While this is good info, where is it documented instead of "here say"? No. Despite being required to publish their sop every year and multiple PIA requests msp refuse to release thier sop. The current one is several years out of date. You can use that to your advantage by forcing them to follow the one published. 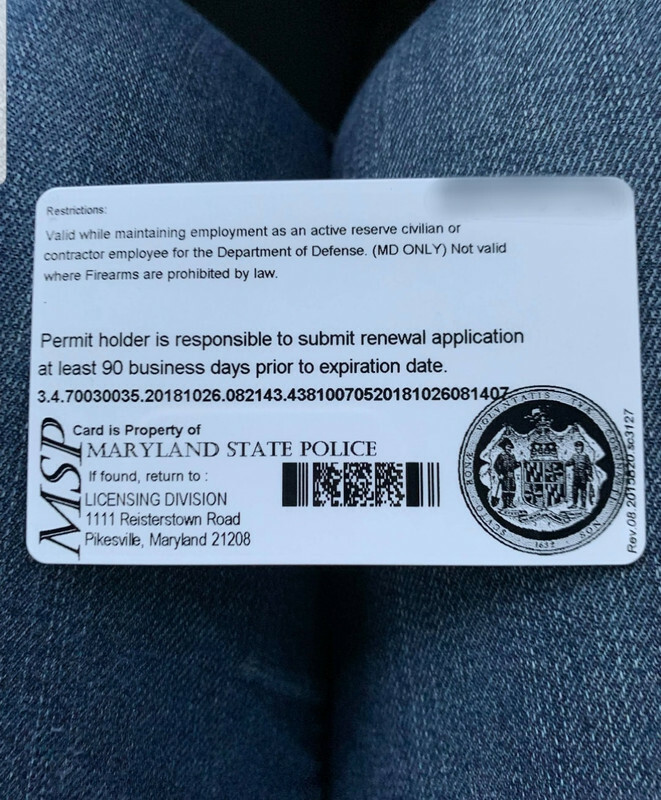 My wife has a permit based on her TS/SCI clearance. And if if you need further proof come to an HPRB meeting or two and it will be made abundantly clear that this is indeed the case. Are you saying using the ODNI SEAD 3 can get a Secret Cleared person a CCW? I assume it would have to be appealed to the Review Board? It would have to go to the review board. Occasionally some one with secret or more than secret can argue there way into a permit at an informal review, but those are vary rare. Compare the sead to the publish sop and you will find almost identical language saying you are at risk because of your job.